You won't want to miss our annual Spring Beer Dinner April 29 at 5:30 pm this year because it's going to be amazing. As usual it takes place inside the brewery with brewmaster Will Kemper talking about the beers being served and chef Jeremy Weizenbaum chatting about the food that's been paired with them. First course features Mexican Style Lager with a fresh oyster on the half shell and Kolsch Granita. Second course it a house made pita served with smoked eggplant baba ganoush and pickled veggies paired with our historic Gerste Lager. Third course is roasted shishito peppers matched with our amazing Pilsner. For the entree we'll be serving duck leg confit with wild rice pilaf, preserved lemon and currants and our Marzen Lager. Closing out the meal will be a housemade Chocolate Sorbet with berries and pomagranates paired with our Maibock. Sound good? 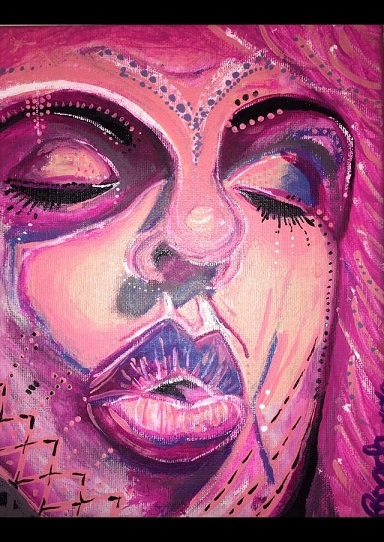 Call 360-752-3377 option 1 to buy your tickets (non refundable but transferable) for $75 (food, beer, tip) plus tax. 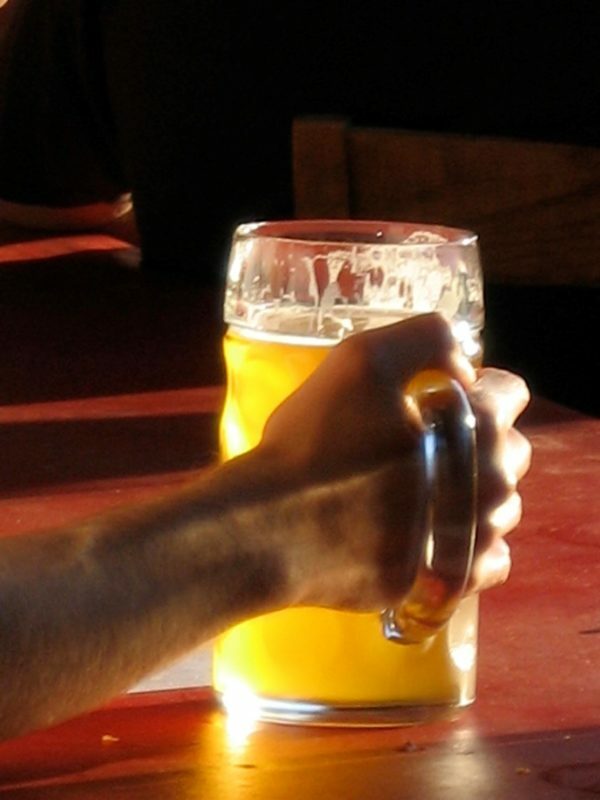 Bellingham Beer Week features Chuckanut's Lecture Series. You will definitely want to hear our special speakers this year. On April 23 John Holl, national beer writer & podcaster, will talk about his upcoming book exploring how the words used in the beer industry are now more important than ever. How we talk about beer and communicate our impressions really matter. April 24 Portland beer writer & podcaster Jeff Alworth will discuss his latest book Secrets of the Master Brewers. Village Books will be on hand both nights selling books by the speakers and other pertinent books about craft beer. 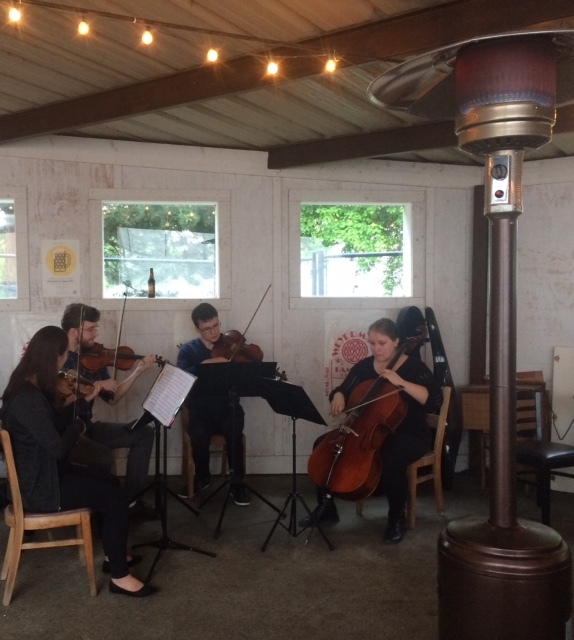 The last lecture will be the kick off of our Classical on Tap series with members of the Whatcom Symphony. Executive Director Gail Ridenour will discuss the music being played by a small group of symphony musicians. This event continues on the last Wednesday of the month throughout the summer. All the Lecture events start at 7 pm in the back patio (dress warm) and are free to attend. Skagit Farm to Pint Week.Win schwag and meet the women in beer in Skagit! Spring has sprung and some of our favorite foods are now on the menu. Our special Matzo Ball Soup is back for the month. A clear WA chicken consomme with a special dumpling that's light and tasty floats in the cup or bowl. Our Thai pizza returns with it's peanut sauce, chicken, and peppers. Of course there's always a special Brulee and some great seafood specials available this month too. If you're hungry come in to try out the latest on our menu. There's lots of celebrating around the state this month. Chuckanut will be in Spokane this month on April 18 and 19. Stay tuned for the announcement at what account we'll be having celebrating at. We will be having a brewers night at Pub 282 on Camano Island and another couple of brewers nights in Tacoma at both The Ale House (April 18) and Zog's (April 19). We always have a nice collection of multiple Chuckanut beers on tap during our brewery night wherever they happen. Don't forget to join us at the Nutty Sisters tapping on April 6 at Elizabeth Station and April Brews Day beer festival in Bellingham on April 28. 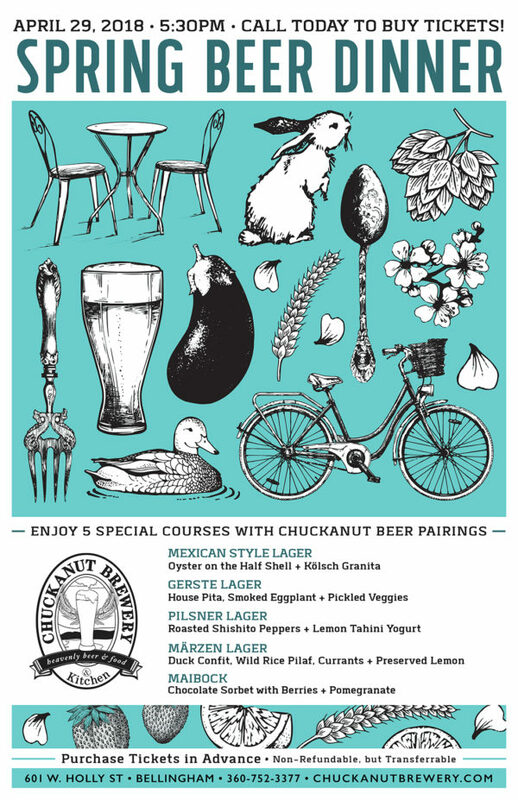 And now look for Chuckanut on tap in selected accounts in Portland, OR! Make sure to watch for this year's Marzen Lager and see if you can get it at one of your favorite haunts or Chuckanut's South or North Nut. One of the most tantalizing of lager beers it's not often around so get a pint or growler fill if you see it. As we get to the end of April our bottled Maibock will be coming out. 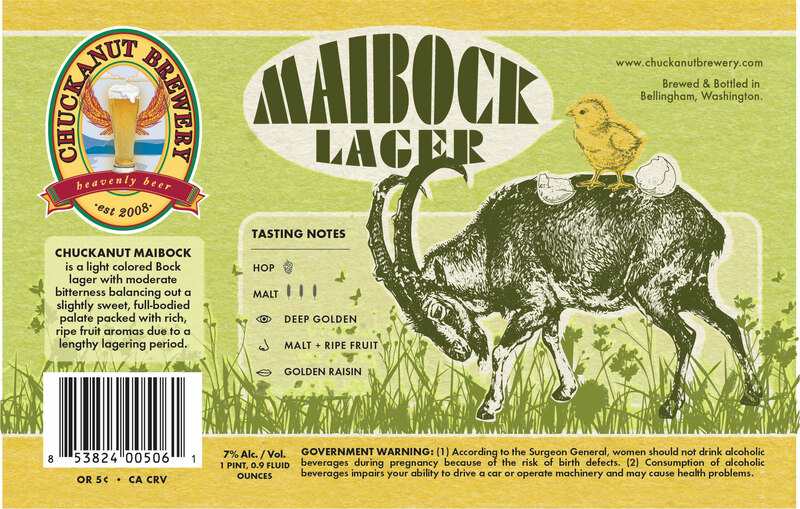 Maibock is the last in our big beer series. A light colored Bock this lager is strong and rich with lots of malty, bready flavors and a nice balanced hop presence. In limited supplies you can get it to go in bottles or on tap.